Royal Bank of Scotland (RBS), the UK bank bailed out by the government in October 2008, has marked the 10-year anniversary of the financial crisis with a page on its corporate website, ‘The bank we’re becoming’. Prominently signposted on the home page banner and in the dropdown menu under ‘About us’, the page contains: a link to a speech by its Chairman, a brief introduction, video, infographic timeline and table of then-and-now financial figures. Visitors must scroll to see most of the material, but there are jump links at the top for the introduction, the timeline and the data table. The 10-year anniversary of the government bailout of RBS – in 2008 it was the world’s largest bank – has received a lot of attention in the UK media, so it would have been hard for the company to ignore the issue completely on its website. Hard to ignore, but not impossible, since other companies facing similar levels of controversy regularly remain silent on corporate digital channels. So it is still notable that RBS decided to create a page dedicated to explaining how it has learned its lesson. It is also notable as part of a growing trend for big companies to promote and defend their reputations online. The effectiveness of the page itself is mixed, with some strengths but falling short of emerging best practice in this area. On the plus side, it strikes an appropriately sober tone; and the video and data table do a good job of bringing in data to support the bank’s claim that it has ‘achieved the biggest corporate turnaround in history, becoming a simpler, safer UK focussed bank doing the right thing for customers’. However, the infographic timeline scrolls a long way down the page and the data table is full of jargon, which will be inexplicable to general readers. With so much comment swirling around the 10-year anniversary, including a few outside voices supporting RBS’s case (assuming some exist) would make the page more persuasive. The next Explain Yourself Index will be published in January 2019. See our site for the previous one. The next global Bowen Craggs Index of Online Excellence will be out in May 2019. Bowen Craggs will be publishing a new Explain Yourself Index in the New Year. David Bowen says it will mirror a shift in high profile companies’ approach to reputation management. Here are alternative approaches to company information on websites. Facebook, which has put up a 10-minute film explaining how it is trying to get to grips with fake news, with employees pondering questions such as ‘what is truth’. Or General Electric, which has recently deleted its About Us and Sustainability sections. Which one is the future? Well, look at the share prices and read the papers. GE always found it difficult to explain itself, because it is so complicated; now it seems to have given up trying. Facebook is doing more and more to face up to criticism, increasingly using its website and (of course) its social media channels. Amazon, now a trillion dollar company, is also using the web to explain itself. It didn’t used to at all. There was no ‘About’ section to speak of, and it let its share price do the talking. But, as Ashley Brown, its head of digital comms, told us, ‘these days you need a corporate website to have a social licence to operate: you can’t be a successful company and not talk about the environment and things’. Its ‘About Amazon’ site and ‘Day One’ blogs are busy busy places. Twenty years ago ExxonMobil defied a growing consensus with vigorous scepticism about climate change, and reportedly did its best to undermine the Kyoto protocol. Now, the corporate home page is headed by a banner saying ‘ExxonMobil joins the Oil and Gas Climate Initiative’. The site is packed with features on its initiatives and views, all saying ‘we are now on the side of the angels’. Companies are increasingly realizing that they cannot simply sit back and say ‘watch our share price’, which is what they tended to do in the past. Their behaviour, and the reputation that follows it, will sooner or later lead through to sales, and so to the share price. It is of course significant that the companies that are under most attack are also those that are getting most firmly to grips with this message. In Europe, where corporate websites are more developed, much-criticised Nestlé has its well-established Ask Nestlé section to tackle issues as they come up. But it is not just hate magnets that think like this. Unilever puts huge emphasis on its sustainability messaging because it is convinced that good reputation feeds through to good sales. In the US, there is a particular need to communicate with politicians. For example Amazon used its blog to accuse Senator Bernie Sanders of making ‘inaccurate and misleading accusations’, though it also responded more substantively by raising its minimum wage. Sanders used his Twitter feed to praise and then query this move. So much of this happened online: a sign of the times. Handling these messages is the job of corporate comms folk, rather than marketing; and when it is online (as it always is), the digital team will be in charge. They are no longer pushing out marginal ‘aren’t we nice’ messages that do nothing for the bottom line; they are pushing out critical ‘this is what we’re doing’ messages that could make a huge difference in the medium or long term. We have previously suggested that corporate communications could be renamed ‘enterprise level marketing’ (or in non-US terminology ‘group level marketing’). Now surely is the time to push that idea, and get it into the heads of the folk on the top floor. What of poor old General Electric? Well, we have a concept call ‘web phrenology’. Phrenology was a pseudo-science that claimed you could tell people’s characters by examining the shape of their heads. Web phrenology is much more credible – you really can tell a lot about a company by looking at its website. GE’s website is appallingly incoherent and, as we have said, lacking a basic sense of identity. The company, I fear, may be similar. I have used the word ‘explain’ a lot, because this column is by way of an introduction to our second Explain Yourself Index. This Explain Yourself Index (to be published in January 2019) will have an expanded methodology, and will focus on the US - though it will also include non-US companies that are well-known in the States. The aim is to find the companies that explain themselves in four ways: first, defending their reputation; second, saying what they do; third, judging how well they report their ESG (or CSR) data; and finally, how well they explain their political contributions and involvement. The last two are new for this year. Explain Yourself is a sibling of our flagship Index of Online Excellence, which remains global, and will go out in May 2019. You could say that the current moves by Facebook and the like are kickstarting ‘Reputation 2.0’. Reputation 1.0 was carried out largely offline, with discreet consultants briefing chairmen on how to talk to the press. Reputation 2.0 is out in the open. Companies need to talk directly to customers, potential employees and the general public. ‘Are we explaining ourselves properly?’ should be a question for every boardroom and C-suite. From that, the step to ‘Are we explaining ourselves properly online?’ is a short and natural one. The next Explain Yourself Index will be published in January 2019. See our site for the previous one. The next global Bowen Craggs Index of Online Excellence will be out in May 2019. The Twitter, Facebook and Instagram presences that Walmart promotes on its careers microsite are labelled ‘Walmart Today’, rather than ‘Walmart Careers’. Walmart Today, the company’s blog, is intended not only for jobseekers, but also employees, suppliers and other stakeholders. The social media presences (and the blog) put the focus on stories about Walmart employees, innovation, quirky interviews and inspirational quotes from the company’s founder, Sam Walton. The Instagram channel, whose stated purpose is ‘Sharing big stories and small moments at the world’s largest retailer’ shares images and stories of a wide range of employees, from truck drivers to an investigator in the legal department. ‘Walmart Today’ is a high-profile example of the current trend for blending retention and recruitment communications; and more widely, for thinking about how ‘internal’ content can and should be used beyond the corporate firewall. Positive stories about employees helps build morale and engagement, while making the company seem an attractive place to work. Social media has the power to bring jobseekers into the existing ‘community’ of employees. Labelling the channels Walmart Today, rather than ‘Careers’, also makes it less likely that jobseekers will unfollow when they join the company. French energy group Total has an ‘Individual Shareholders’ area in the Investors section of its corporate website. This includes a page titled ‘Individual shareholders explain why they invested in Total’. The page includes four testimonials from private investors, each accompanied by an illustrated portrait of the investor, plus their abbreviated name – eg ‘Jacques C’. The testimonials emphasise the length of each investor’s shareholding, as well as the advantages of Total as an investment. The bottom of the page features an illustrated portrait of Total’s chief financial officer, and a quote from him on the ‘great importance’ of the company’s relationships with both individual and institutional investors. Profiles are widely used in Careers sections of corporate websites to ‘sell’ a company to jobseekers. They’re rarer in investor relations sections. Total’s investor profiles have two benefits. First, they bring to life the company’s investment case to potential individual shareholders. Second, they send the message to existing shareholders that they are important to Total – and part of a broad and longstanding community. As we pointed out in a previous BC Tip during 2014, other companies, such as L’Oréal, have produced investor profiles in video format. Total’s magazine-style approach shows how such profiles can be also effective without the need to invest in sophisticated audiovisuals. Enel, the Italy-based power company, offers a Facebook Messenger news bot which it has named ‘elen’. The bot is accessed via a Facebook Messenger icon in Enel.com’s navigation, positioned prominently next to the hamburger menu icon on the right hand side of the header. It can also be reached via the group’s Facebook page. The bot begins by introducing itself as a news bot and informing the user that they can tell it what topics they are interested in, or use a menu presented in the bot, which is a series of links to areas on the corporate site such as news, press releases, and stories. It also offers an introduction to the company and its sustainability activities. Users can ask elen questions or type in topics, and the bot automatically produces basic answers or links to the corporate site. If it gets stuck, as it did on a question about the company’s position on global warming, elen allows the user to request an answer from a human – which we received promptly. Elen will be useful to audiences who want basic, general information and news, and the informal tone helps to humanise the company. It also sends a signal about the company’s innovative approach, but those wanting more detailed information are still better off sticking with the corporate website. Ultimately, the bot works best as a way of funnelling Facebook and mobile users back to the corporate website, and presumably deflecting contact about basic company information (but still needs humans for more complex answers). It is something of a risk to tie the bot to a particular platform, in this case Facebook Messenger. Not all corporate website users will have installed Facebook Messenger, and may be unwilling to do so or to log in on desktop. Promotion of elen is weak too: although the Facebook Messenger icon is located in the header, some users may not be aware of what it is. It is not clear, before clicking on it, what exactly the user will get in return. T-Systems Germany, by contrast, has a careers chat bot offered directly from its website which does not require any third party platform installation, as we wrote earlier this year, and which states clearly what it can be used for. Disappearing social channels, shrinking background information, crumbling navigation and an unhealthy focus on press releases... Scott Payton finds evidence of decline on five G7 leaders' websites. Back in March 2015 we toured the official websites of each of the G7 leaders in search of ideas for corporate digital managers. We found much variety and some useful lessons. A marked drop in social media activity on most country leaders’ official websites. Use of social channels by political leaders might have become more prevalent – and has certainly become more contentious – in the last few years. But this has become much less visible on their web presences. A deterioration in navigation: it’s generally harder to find key information and easier to get lost on all five of the sites we revisited. A tightened focus on news: all five of the G7 leaders’ sites we revisited are more fixated than ever on bypassing the traditional media to convey the latest speeches and press releases to the general public. Expanding this role of the site has, however, come at a cost to others. For corporate web managers, the sites discussed below are worth visiting to gather ideas on conveying news to generalist audiences. But in many respects, the best corporate websites now dramatically outclass these public sector counterparts. During the Obama administration, the White House website was awash with tools and materials designed to get citizens ‘involved’ – from signing petitions to sharing videos and infographics carefully designed to ‘go viral’. We wrote approvingly about all this in January 2013. Revisiting in September 2018, it’s a very different site. Attempts to encourage citizens to engage have been substantially scaled back. There is no longer a ‘Social Hub’, ‘Engage’ page or ‘Participate’ main menu link. There is a link labelled ‘Get Involved’, hidden behind a hamburger menu (poor practice in desktop mode of a site), and in the footer. This leads to a page offering just three options to engage – sign up to email updates, write to the President or apply for an internship or fellowship. Social media integration is limited to a panel showing a recent @whitehouse tweet on the home page, links to the President’s and other officials’ Twitter feeds on biography pages, plus standard footer icons linking to the official White House Facebook page, Twitter feed and Instagram account. The primary navigation menu consists of five policy topics – Economy, National Security, Budget, Immigration and The Opioid Crisis. On click, each leads to brief introductory material on the topic, followed by a list of links to related statements, fact sheets and other information. It is a simple approach – but clear, intuitive and far more informative (if uncompromisingly partisan) than equivalent material on the four other sites we revisited. Information about the White House itself has been stripped back, too: an elaborate multimedia tour has been removed, for example. Site layout is clean and clear, and users who take the time to dig into the site will find some useful information on various executive offices and the people who run them. Navigation and orientation provisions are very poor, however: it is hard to work out what each section contains, and to keep track of where you are within them. Justin Trudeau may share little common political ground with Donald Trump, but his official website is also less ‘social’ than his predecessor’s. There is no longer any signs of ‘24 Seven’, an ‘online magazine that publishes shareable content’, which used to be a key part of the Canadian prime minister’s site. Like the Trump-era White House site, the official Trudeau web presence has been simplified and decluttered – though an embedded @CanadianPM Twitter feed features prominently in all key sections. While policy topics dominate the White House site’s primary navigation menu, there are few signs of them at all on Justin Trudeau’s site. The focus, instead, is on news and photos. Visitors looking for information about the role of the Canadian prime minister and his offices will be disappointed, too: there is good biography information but little else. 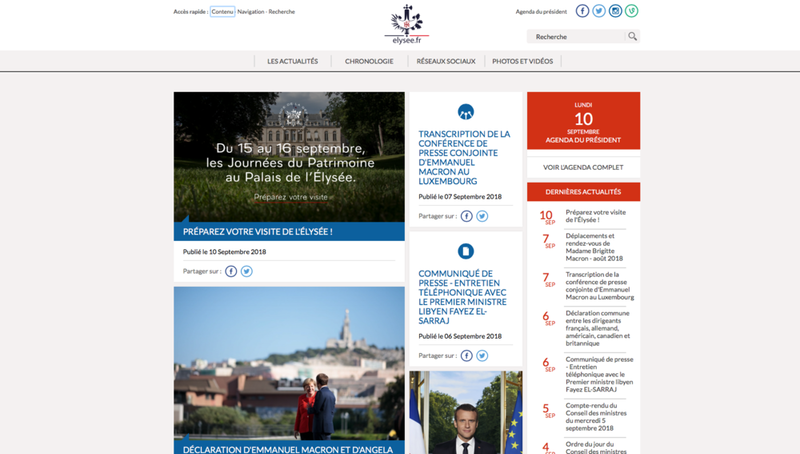 The online home of the French Presidency is far more ‘social’ than its US and Canadian counterparts. Indeed, before users can reach the site’s home page they are urged to ‘Like’ the official Facebook page. The home page itself is dominated by a grid of videos, images and other materials designed to be shared on Twitter and Facebook. ‘Social Networks’ is a primary menu link. ‘Share’ icons are festooned across the News landing page and elsewhere. Policy topics get far less prominence than on the White House site. And although the home page was full of fresh material during our September 2018 visits, there were signs elsewhere of serious neglect: the ‘Social Networks’ landing page contained just four tweets – all from May last year. And like the White House site, navigation is weak. For example, a substantial but poorly presented section providing information on the role of the French Presidency appears to sit entirely outside the primary section structure of the site. As in our previous visits three and a half years ago, the UK Prime Minister’s office does not have its own website. Instead, it occupies a tertiary-level section of Gov.uk, the UK government’s comprehensively consolidated website. This remains a serious drawback. Gov.uk is designed to make it easy to find and fill out government forms, pay bills and complete other linear tasks. It does this very well. But the site is not designed to house editorially or visually rich information, or to make it easy for users to jump between different categories of material deeper in the site. Moreover, some parts of the Prime Minister’s office section are astonishingly thin: the ‘About us’ area consists of just one paragraph, for example. The online presence of the Italian presidency has improved since early 2015 – though problems remain. An extremely dated site has been replaced with a modern offering that takes its visual cues from online magazines. Like the other sites discussed above, it suffers, however, from confusing navigation: key links are buried behind a hamburger menu even in desktop mode, and the news-focused home page is full of baffling icons that are anything but self-explanatory. And like most of the other G7 leaders’ sites, social media integration is minimal. The priority, once again, seems to be to broadcast news directly to citizens, without journalists or social media users getting in the way. Cookie compliance notices may be legally necessary in Europe, but the US software giant does nothing to sweeten the user experience. Although cookie notices are commonplace in Europe following the adoption of GDPR regulations earlier this year, a cookie notice we came across on Oracle’s UK site is unusual. During our visit, this was followed by a note stating ‘You have successfully updated your cookie preferences’ together with a contradictory warning that ‘… Some vendors cannot receive opt-out requests via https protocols so the processing of your opt-out request is incomplete.’ and inviting us to try again. Oracle’s verbose and legalistic approach to cookie compliance risks irritating and alienating users – lawyers seems to have been given free rein to create a form, without any attempts to make it user friendly or easy to digest. The complexity may be unnecessary (when compared to most of these notices we have come across) and the ‘few minutes’ processing time adds to the irritation. Together, the approach undermines this technology company’s attempts to look technologically slick. Although Oracle’s digital managers could not decide whether or not to publish the legally required cookie notices, they could have done a better job to influence how the options are presented to visitors. Netflix, the fast-growing US media streaming company, has a podcast on its careers microsite, ‘How We Hire at Netflix’. Produced in May 2018, it is the second in a series of podcasts on all aspects of the company, ‘We Are Netflix’, which has been running since March. In the podcast, a presenter interviews two representatives from the human resources department, covering the company’s self-starting culture – ‘some people will thrive in this environment and some will not’; the interview process and how salaries are negotiated; as well as controversial issues in the technology sector such as diversity and ‘implicit bias’ in job interviews. The podcast is unusual for its openness and its length. The guests appear to be answering spontaneous questions, and although the interviewer doesn’t probe too far and they don’t give away any trade secrets, the treatment of controversies is far more open than in most corporate productions. At nearly an hour, it is much longer than most corporate podcasts, perhaps mirroring the current fashion for ‘long-form’ articles. The length and openness will likely appeal to many jobseekers. However, those pressed for time (which include jobseekers with families, who are mentioned in the podcast) may not have time to listen to all of it; and there no context provided for them, such as a summary, bullets or excerpts. For example, one of the most interesting tidbits comes at the end, in a discussion about salaries. For ‘80 to 90 per cent’ of candidates, they are asked to accept a job before knowing what the salary will be, because Netflix knows it already pays at the ‘top of the market’. Some potential hires, who stop listening before the end, may never hear about that. 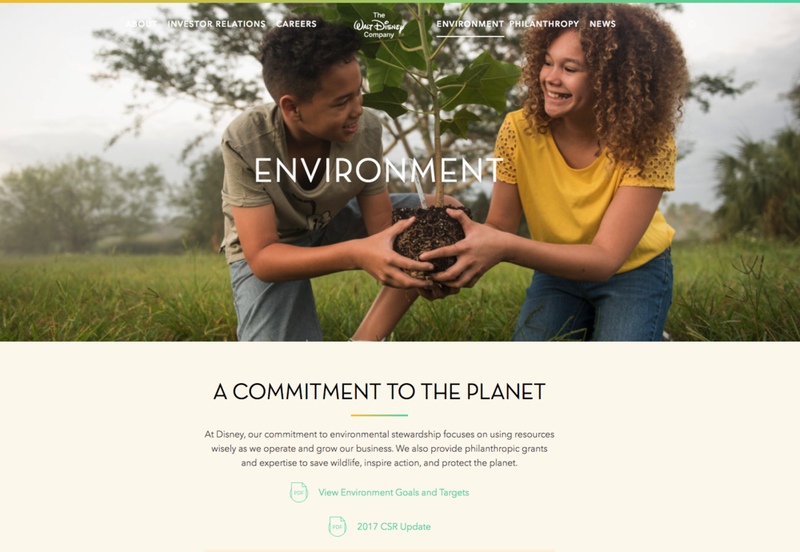 The Walt Disney Company’s corporate site has a primary section titled ‘Environment’. On click, users are taken to a landing page with a prominent link to a ‘2017 CSR Update’ PDF, visible without the need to scroll on a standard desktop monitor. Clicking this link leads to a PDF with a list of links to six language versions of the CSR Update. Each of these has a clearly presented, hyperlinked contents page, with ‘Data Table & Footnotes’ included in the contents options. Clicking this option leads to a comprehensive table of non-financial performance data for the last three years across a wide range of metrics, including emissions, philanthropy, employee diversity and supply chain ethics. The PDF also includes a comprehensively hyperlinked GRI Index and an overview of CSR performance against targets. Like many major US companies, Disney is increasing its efforts to communicate its CSR performance. While its online presentation of this issue is not sophisticated, it is effective in three ways. First, CSR performance data is exceptionally prominently signposted. Second, the use of hyperlinks in the PDF CSR report makes it easy for users to jump to specific information. Third, Disney aggregates top-line performance of a good depth across multiple metrics in a single table. The provision of this data in downloadable Excel format, the inclusion of information on performance against targets in the aggregated table, would make Disney’s strong provision even better – as would an overhaul of the Disney corporate site’s flawed navigation system. The arrival of 'media asset databases' in two corporate sites gave David Bowen great hope. Until he tried to use them. A couple of years ago I wrote a piece headed ‘What to do with the poor old media section?’, pointing out that as press officers rarely know who they are serving any more, it is not surprising press areas are also confused. Are they for ‘journalists’ in the old fashioned sense, for anyone who writes anything on the internet, or perhaps for everyone? But I did say it is important to have a service for media professionals who need to find something quickly: how to spell the CFO’s name, what brands the company owned, a photo of a factory. That sort of thing. At the time the fashion was for ‘social media dashboards’ – where companies could display all their latest tweets and the like. I couldn’t (and can’t) see the point of these: journalists can set up their own social media monitoring, and the last thing they want is a selection sanitised by the company they are covering. But one company was doing it right. Siemens has for several years had a press section that is a searchable database of ‘assets’ – press releases, photos, background materials and the like. Here, you can choose the bit(s) of Siemens you are interested in – or select them all – then do a search using a keyword and/or date range. It worked, and works, well. So it was with joy that I discovered that two sites I was reviewing last week have adopted the same idea. Vale, the Brazilian mining giant, and Philip Morris International, now have press sections that are asset databases. Unfortunately my joy diminished as I tested them out: they have the theory, but for the moment they are just annoying. Vale is the better of the two, and in some ways works well. You can for example click Environment, and see all relevant assets listed on the page. Or you can put the CFO’s name in the search box, press return, see a list of assets, then refine them by theme, type or date. But if you do not do what the mechanism wants you to do, you are undone. Put the CFO’s name in and click ‘search’ rather than hit return, and nothing happens. The main filter list (‘Type’) does not include press releases. To see them you have to click something else, such as Photos, then click to get a much bigger set of filters. Still no press release option here, but click ‘All’ and you will finally see some. These are just a few of the hurdles I hit while trying to use the site. What should be a massively powerful system is instead massively irritating. It needs a thorough assault by usability testers; then it will be indeed massively powerful. If Vale’s database is over-complex, PMI’s is just baffling. It appears to have a search box at the top, but it is not one – rather it is a category selection menu, but with only one option: ‘All categories’. So you can’t search or filter the database. A set of ‘tags’ at the top appears to offer a filter option, but does not – if you click one of them, the page scrolls quickly down to a panel on the page. Try that with ‘News’ and you get to press releases – but there is no way to search or filter them. In one way this has the opposite problem to Vale: it is not sophisticated enough. But it shares another: it does not work well. I’m not suggesting that Vale or PMI should drop these mechanisms. They should just make them work better. Then other companies should follow their examples but avoiding the birth pains. Siemens has been getting it right for ages. Why can’t others? GSK, with its ‘Behind the Science’ online magazine, is an example of a company doing this well. Abbvie has some gems, including this feature about one of its chemists. PMI has a well-produced and engaging video about why its scientists choose to work in the tobacco industry. Danaher, an American medical and industrial diagnostics giant, is an example. It must have many, many good stories lurking in its laboratories, and the management certainly wants people to believe the company is innovative. We know this because the corporate website repeatedly makes unsupported claims to being innovative; without taking the risk of telling a good story to demonstrate it. Its ‘Feature stories’ in the news section are really glorified press releases. This closed ‘tell don’t show’ approach is unlikely to convince many people. The pieces from the Guardian, HBR and McKinsey which I’ve cited above are worth reading even if they are targeted towards scientists and entrepreneurs – there are some good ideas that could be adapted to the corporate environment. An example is McKinsey’s categories of stories to look for – ‘serendipity’, ‘perspiration’ the ‘underdog’, etc. The words of Tom Joyce, president and chief executive of Danaher, are featured unusually frequently across the company’s corporate web estate. If you let senior managers dictate what is on a company’s website, it will be very dull, as the bland pronouncements from Danaher’s CEO demonstrate. We think digital managers should be given the authority to decide what – and more importantly, what does not – go on the corporate site. However, we know that in the real world, not many digital managers have the influence to say an outright ‘no’ to their CEO. Only a lucky few would have enough authority to say to Mr Joyce, ‘your words are far too boring to be published’. The most effective digital managers use persuasion to get their way. For example, the people that run Danaher’s site might reasonably argue that quoting Mr Joyce so much undermines the company’s public commitment to ‘diversity and inclusion’; and crowds out the voices of ordinary employees that would be more engaging online. Alphabet was set up to act as a holding company for Google and other companies in August 2015. Its site, with the URL abc.xyz, was launched on August 10 that year to explain its raison-d'être and to link to its investor area. The home page has not changed since that date. It is visually simple, with 'G is for Google' as the headline, a scattering of colourful building blocks to the right, and a link to Investors in the top right corner. Clicking 'more' reveals a letter written by Larry Page to explain the thinking behind the company's establishment. The letter starts 'As Sergey and I wrote in the original founders letter 11 years ago ...'. The investor section has earnings releases and SEC documents presented in a simple table, with a variety of formats. The Alphabet site has several strengths. It looks good, is simple and, most importantly, has a nicely informal style in the letter. Even though the content is purely corporate, this does not feel like a standard corporate talking to us. That presumably is the point. We even forgive the missing apostrophe in 'founders'. But the site is lacking in two ways. First, there are no links to the companies Alphabet owns. The letter says that 'Alphabet is mostly a collection of companies. The largest of which is, of course, Google.' What are the others? A corporate site that does not explain the basics is flawed. Second, the home page has not changed one jot, though the investor section has been kept up to date. That no-one has thought to update '11 years ago' as time has rolled on speaks of abandonment, or certainly not the dynamism Alphabet otherwise exudes. A small thing perhaps, but the corporate home page is the first introduction many will have to a company, and one that says either 'careless' or 'uncaring' is not doing that job well. A US software company uses excellence in visual design, a core part of the corporate identity, as the theme for its Instagram channel. Adobe, which makes software for designers, bases its Instagram presence on excellence in visual design. The company crowdsources the most imaginative and striking images from its 753,000 followers (up from 600,000 in January). For the month of July, Adobe’s followers are being encouraged to send sky- and space-related images with the hashtag ‘#Adobe_Cosmos’. June’s theme was ‘Adobe in colour’, and when we previously visited the site in January, the theme was minimalism, under the hashtag ‘#lessismore’. 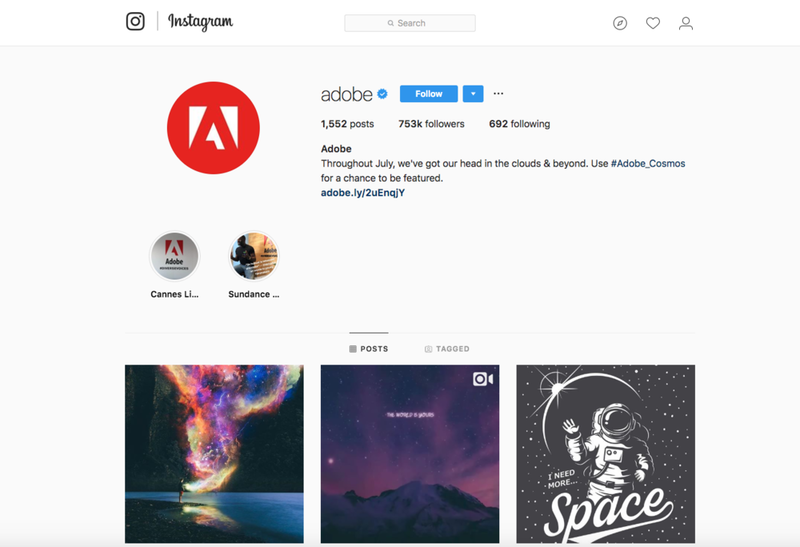 Adobe’s Instagram presence is a creative and appropriate use of the channel, where people seek out memorable images to comment on and share. Adobe’s approach is highly engaging for customers, and informative and fun for jobseekers. Some companies will want to use Instagram to make a more conventional and direct appeal to their online audiences, by more frequently featuring employees in posts, for example. 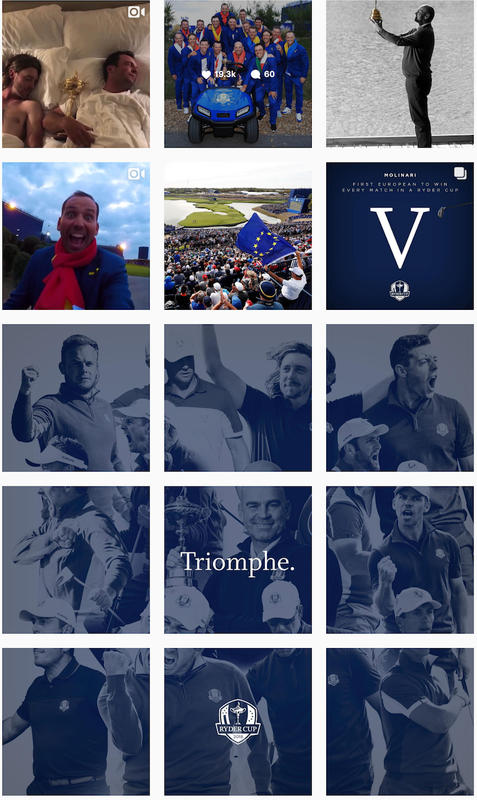 However, introducing an appropriate theme for a set period could be a way to generate new interest; similar to ‘Instagram takeovers’, in which an employee posts exclusively to the channel for a few days or a week. What are your challenges with… serving customers on corporate sites? The final session of our annual conference in Lisbon three weeks ago was called ‘Talking tables’. These were breakout sessions in which delegates discussed some of their most pressing challenges as digital corporate communicators, facilitated by a Bowen Craggs consultant. Here, Jason Sumner, who facilitated the ‘challenges with serving customers on corporate sites’ table, reports on the issues shared and solutions identified. Customers are not ‘supposed’ to visit corporate sites, yet they do, often in great numbers. According to anonymised data from the Bowen Craggs library of 400,000 corporate website visitor surveys, customers are the second-biggest visitor group – behind jobseekers – accounting for nearly a quarter of all visitors. When we run surveys of corporate digital communicators asking them to tell us their biggest challenges, ‘customers on corporate sites’ is consistently at the top or near the top of the list. Your colleagues outside digital comms may still have trouble believing it though; partly because they need and want customers to be somewhere else – on the brand or retail site, or country site, or anywhere else actual sales happen; and definitely not on what is thought of primarily as a ‘communication’ platform. Although some delegates at our table have moved beyond this stage, getting colleagues to acknowledge customers visit the corporate site is still an issue for others. One delegate put it this way: ‘we are still at the stage of convincing internally that customers are a group to be served on the corporate site‘. Of course, ‘serve’ can have many different meanings – all the way from actually closing a sale, to quickly routing a customer elsewhere, or showing them an interesting story about your company; but that is where the complexity comes in, and the need to tailor an approach that works for your company’s unique situation. Other challenges the table identified were wide-ranging, including recognising that customers come but there is nothing tangible on the site to ‘sell’; having different combinations of product and services available across countries, making it hard to explain on the global site; dealing with multiple sites, even at country level; lack of processes to pass on contacts and a poor working relationship with sales and marketing; multiple social media channels in different languages; lack of tie-in with back-end CRM systems, etc. The approaches identified above would certainly resonate the clients we consult with; but each one opens up another Pandora’s Box of challenges. For example, serving customers more on social media could be a good idea, but it raises new questions about content and governance: for example, which social channels are for customers, who owns them (and if multiple owners how can these teams best work together), and what do you want customers to do when they read a post? Personalisation, as noted in bullet three above, is growing in interest again. We are sceptical about purely technical solutions, when good navigation and structure can go a long way to routing customers accurately (but that is a subject for another article). Surveys and user journeys are crucial, from our point of view. Surveys give you important data to help discover who your customer visitors are and what they want; but also to prove to others in the organization that customers are coming and something must be done with them. We find that in running surveys for clients, it is important to ask questions that have the right level of detail, so ‘customers’ groups can be further segmented into sub-groups. It is also important to measure whether customer goals are being fulfilled and whether their impression of the company is positive or negative. Movement in the ‘net promoter score’ – the difference between those with a positive versus negative impression of the company – can be powerful evidence to convince colleagues. Along with surveys, mapping authentic customer journeys (which can be built from survey answers to develop detailed and accurate personas) is a way for our clients to cut through complexity to find big-picture problems as well as quick fixes. These should include all possible starting points for your customers, the corporate site, country sites and Google. The big-picture insights can often be surprising. One client we worked with had the stated aim of doing next to nothing for customers on the main global site (fair enough) because all selling happens at country level. However, only a few minutes of testing revealed that there were big problems with signposting on the global site, and it was failing even in its one job – to get customers to country sites as quickly and efficiently as possible. Conducting detailed journeys can also help you venture into areas rarely visited to make quick fixes – finding multiple 404 errors in links product finders; uncovering a useful but largely hidden Ukrainian history section; or discovering product literature five years out of date on the France site (all real-world examples we have come across). Adding research on best practice in the industry and wider online world can inspire improvements, and also help convince colleagues if the service on your site falls short. Two other solutions our table raised have to do with internal politics – having better relationships with marketing, and acquiring more resources. These are certainly not quick wins, but arming yourself with data from surveys, and evidence from customer journeys and wider best practice will put the digital comms team in a stronger, more useful – and respected – position within the organization. The provision of links to press officers’ Twitter accounts and LinkedIn profiles on a Media contacts page conveys an impression of openness and is likely to be appreciated by journalists. French construction group Vinci has a ‘Media contacts’ page within the Media section of its corporate website. The name, job title and photograph of four press and communications officers is provided, along with direct telephone number for each, plus links to their email address, Twitter account and LinkedIn profile. This Media contacts page also includes the contact details of two investor relations officers. Direct telephone, email and LinkedIn profile links are provided for each of these IR contacts – but there are no links to their presences on Twitter. The provision of links to press officers’ Twitter accounts and LinkedIn profiles is relatively unusual on a corporate site’s Media contacts page – but it makes sense for both the company and the journalists who cover it. Providing such details (alongside direct telephone and email contact details, which is also good practice), conveys a positive message of openness and transparency. It is also likely to be appreciated by journalists – many of whom are prolific users of Twitter in particular.